An early morning departure from the Fleurieu Peninsula and our sense of adventure heightened as we set off on the next leg of the road trip. We were heading further west towards the Eyre Peninsula and to camp at Streaky Bay, where we would also celebrate Christmas day. As we left the rich, green vineyards of the Fleurieu Peninsula, we could not have anticipated the vast and desolate expanses of our nation we were about to see. Bypassing Adelaide and the Yorke Peninsula for now, we joined the Eyre Highway at Port Augusta, a sea port and railway junction city on the east coast of the Eyre Peninsula at the head of Spencer Gulf. Port Augusta is the seventh most populous city in South Australia and although its industrial appearance does not endear you to stop for a seaside stroll, it is a popular tourist base for those wanting to explore the nearby Flinders Rangers. We had heard stories, read blog posts and been offered tips from fellow travellers on the best there is ‘to see and do’ in each place. A friend had told us that there was really not much variety to see on the 400km stretch of the Eyre Highway travelling between Port Augusta and Streaky Bay and she was correct. Indeed the road continued on and on for many kilometres of the same landscape, large expanses of wheat fields, low shrubbery and dusty, barren plains with the occasional small town and fuel station in between. We stopped at Kimba for a late lunch, a little town (in the middle of nowhere) where you can buy opal, jade and gemstones. Kimba also claims to be ‘the halfway across Australia’ point when driving from the east coast to the west coast, so that made us feel like we had made progress. As we continued along the Eyre Highway, each approaching town was pre-empted by a tall, white grain silo looming on the horizon, the towns of Pygery, Yaninee, Karcultaby, followed one another, until finally we exited the Eyre Highway at Poochera and headed south to the coastal town of Streaky Bay. Streaky Bay is the major service centre for the surrounding rural district. Grain crops such as wheat and barley are supported by beef, sheep, pigs and poultry farming. Once arrived at the camping ground on the edge of the bay, our campsite was a little more barren than we expected, especially by comparison with the grassy patches we had experienced on our trip so far. We were very thankful for the couple of trees nearby that provided welcome shade on the 38°C hot summer days that followed. Up went the tent including some simple Christmas decorations and then we found ourselves sitting by the bay as the sun sank low, eating bowls of pasta, watching the tide creep out and the birds do their final business of the day. We spent the following day boating out in the middle of the bay in search of line caught fish. However, after moving the boat to a couple of different spots, we were only really successful in catching weed. Then the wind came up, the fishing didn’t improve and after a rocky, picnic lunch on board, we surrendered and returned to shore. Mr G was disappointed with our lack of fish, however his eyes widened and hope was restored at the sight of a fellow camper walking by our site with a generous catch of blue swimmer crabs. That evening after dinner Mr G (who is not to be held down for long), headed out at dark into the shallows of the bay with his crab nets and light, in an attempt to redeem his day. Just half an hour later he appeared at the door of our tent to show us a large blue swimmer crab he had caught. This soon roused the adventurer and I from the comfort of the tent and we joined him in the knee-deep waters to be part of the excitement. It was a thrilling experience to watch the crabs swim sideways through the shallows and observe Mr G’s joy at capturing them one by one. We had such a delightful time together scooping up the crabs and returned to the shore a couple of hours later with a net full of blue swimmer crabs, eight in total. Mr G was now content to sleep soundly with the knowledge his ‘hunter, gatherer’ status had been restored and a seriously good feed of crabs awaited him at daylight. Christmas day followed, our first waking up in a tent and then cooking freshly caught crabs at the camp kitchen before breakfast. It was in the camp kitchen that we also stumbled upon some local knowledge about a good fishing spot for King George whiting at a pristine place not far away called Sceale Bay. We decided it was far to hot to contemplate eating a long Christmas lunch at the campsite for now, we would save that for the cool of the evening and instead we elected to pack a simple picnic and go for a drive to Sceale Bay. We spent our day swimming in the crystal clear waters and picnicked in near seclusion on the beach, then spying out the location of the boat ramp and the places recommended to us we planned to return with our boat the next morning to fish. Detouring on our way back we took a drive along the Westall Way Coastal Scenic Loop, which stretched for 31km and was jam packed with scenic lookouts and gorgeous swimming spots along the way. If you do ever get to drive this scenic loop, make sure you stop and get out of the car at each of the sign posted spots, as what you'll discover is so worthy of the moments spent. Returning to our campsite in the late afternoon we enjoyed the shade of those beloved trees and sat down to feast on our seafood Christmas dinner. A feast it was too featuring cooked and chilled Spencer Gulf prawns and Streaky Bay blue swimmer crab, lightly crumbed calamari rings, salads, bread and McLaren Vale apple cider, all laid out on our camp table. Our table centre piece a branch of gum tree, steadied in a jar of sand and lavishly decorated as our make shift Christmas tree. It was the perfect end to what had been a very different and yet unforgettable Christmas day for us three. The next morning we were up early and with the boat in tow, we headed back down the dirt road that took us out to Sceale Bay in search of King George whiting. It is hard to say what was more wonderful, the beauty and serenity of the surrounds as we cast our lines into the turquoise waters or the magnificence of our bountiful catch that day. We bagged a large squid, a flathead and six of the prized King George whiting, there were many squeals of delight from the three of us whenever one of us proclaimed ‘I think I’ve got one!’. That night more feasting followed and we realised that this was truly a delicious adventure we were on. 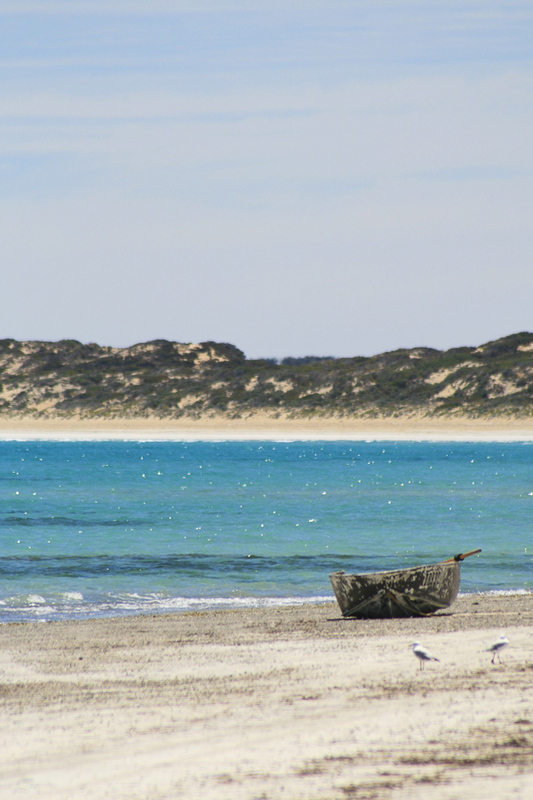 Our time at Streaky Bay was up and the following afternoon we had the unenviable task of packing up camp in 38°C heat and then continue our journey toward Western Australia. We gradually packed up, pausing every fifteen minutes to wash our faces and feet with cool water at the nearby tap and gulp down a cup of water to stay hydrated. There was much relief to finally hook up the boat, shut the car boot and retreat to the comfort of the air conditioned car. We drove out of Streaky Bay and back on to the Eyre Highway to head further west towards our first crossing of the Great Australian Bight, The Nullarbor Plain and the lengthy drive to cross the border into Western Australia. It was unknown to us at the time that we were about to begin the toughest twenty-four hours of our journey so far.